The Howe Family went to many church- and faith-related meetings and conventions. 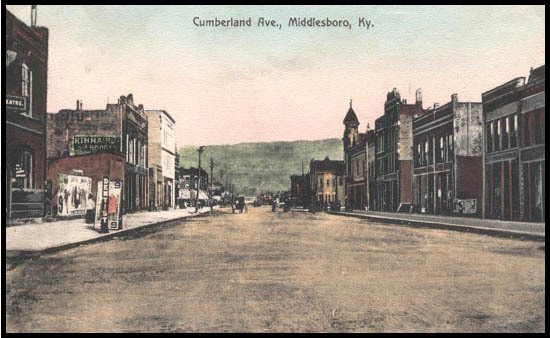 In today's post, Sarah describes their trip from Carrollton to Middlesboro, Kentucky. The trip involved travel by boat and train, and it didn't go smoothly. Still, it was pure adventure to 9-year-old Sarah Eva Howe. She wrote this memoir in the mid-1940s. 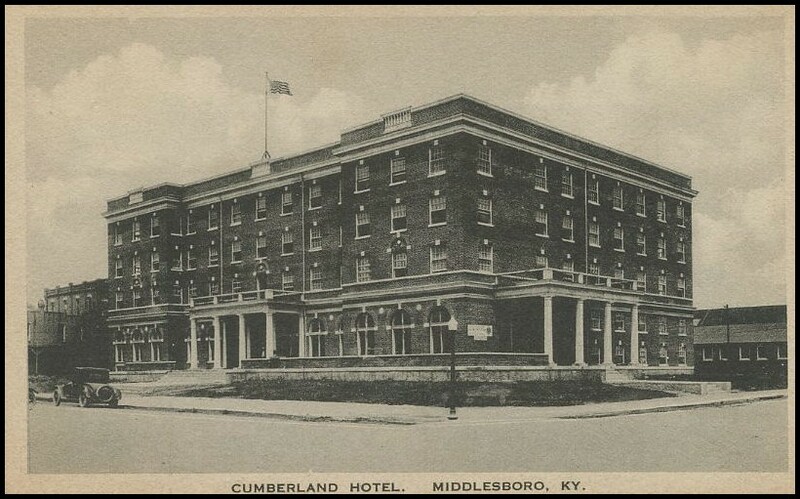 I am not sure now which year we went to Middlesborough (as it was spelled then) and which to Louisville, to the Christian Endeavor Conventions; but I believe the Middlesboro trip was in June of ’92. Papa loved to go to these conventions in those days before he went to New York;1 they were such a break in the monotony of his life. He was never intended to be a businessman, tho he was a good one! He wanted to follow a profession and to have been a professor in a college. That would have been ideal for him. He was devoted to church work, too, and had many forward-looking ideas that were far ahead of his contemporaries. So here I will put the trip to Middlesboro, even if I have it wrong by a year or two one way or the other. The main thing I remember about the trip was that it took all day to get started! We must have gone to Louisville on the boat to take the train out of there for Middlesboro, but there had been a wreck on the line, and our train — which should have started at 8 a.m. — didn’t go till 5 p.m. ... We waited around all day. It certainly was tedious, and there was really no place to buy things to eat except a small country store; Papa bought bananas and such, and I remember his taking me for walks up and down the track and around. They didn’t get the wreck cleared away for seven or eight hours. When we finally started, the train went so fast it really must have gone a mile a minute, considered almost the limit at that time. How I remember the dark falling and the black landscape rushing by with the speed of the wind, it seemed to me. operators and speculators who hoped to make a city of the size of Covington at least, perhaps Louisville. Harrogate too, over in Tennessee, was built up. English money built a lot of the property, and much of it was lost when the bubble burst not so long before the time we went there. There had been a big fire, too, that swept much of the town and burned the shiny but un-outstanding frame buildings and also many of the little ones. Mr. Jim Fisher and his wife lived there, also Uncle Will and Aunt Sue Salyers2 and their family (tho Ida Ruth and Charles were all that were living by that time, perhaps not even Charles). There were several more fires after we left, and finally I think the beautiful hotel, then rather in disrepair, has burned too. But it was certainly pretty when we were there, tho not too full of guests until the “convention” came. I wore a jacket of Roman striped French flannel “pinked” on the edges and my favorite little dark red velvet round hat; my hair was in plaits but looked short from the front, so the hotel man said “Mr. Howe,3 the room is so-and-so, meals included, but we don’t charge for your boy.” That amused Papa, I know. Characteristically, the thing that remains with me of the trip is the “outside” rather than anything about the convention. The trip up the pinnacle, Mama4 holding my hand firmly, oh so firmly, as I looked at the city of Harrogate so far below like a toy village from the overhanging rock, of the place where you could stand in two states at once “and spit in the other,” as someone said — Tennessee, Virginia, and Kentucky. But the most vivid memory is of Solomon’s Cave — my first “underground” experience. The formations are said to be more beautiful than many of those in Mammoth Cave, and there is a long narrow way where you have to crawl along, worse than the “fat man’s misery” at Mammoth Cave. There was very cold water dripping and flowing through it, which has caused the cave to be closed to visitors in later years, as the water supply of Lincoln Memorial College comes from these cold springs. There were wooden staircases that we went up and down, rocks we clambered over, and altogether it was very strenuous exercise. Going up the Pinnacle was easy, for it was not done on foot but in a big carriage with, I believe, four horses pulling about eight people in the carriage. 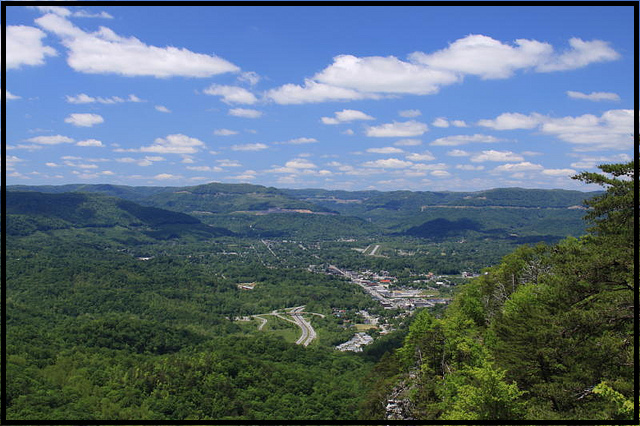 We came out into Cumberland Gap, the only time I ever set foot there, tho many times I’ve thought I’d visit there! — and the only thing I remember was a large white rat in a cage, which interested me, for it was the first white one I ever saw, and I did wish to have it! We took the train back home; on the way we met many friends. (I’ve heard Mama tell of them but don’t personally remember them.) I believe Uncle John Smith was aboard the train — perhaps he went down with us. There was a very tall slim young preacher with heavy black hair whose name was U.V.W. Darlington, who talked to us part of the time. For days after our return, Mama was so stiff and sore from the unaccustomed climbing that she could hardly go up and down stairs and had to take the steps sideways, but I don’t remember it affected my short stocky legs in any way. 1 Robert James Howe and his brother Joseph Brown Howe traveled to New York City (and other large cities) to buy fashions to sell at the family's Howe Brothers Department Store in Carrollton, Kentucky.